It is always interesting to talk to our customers. I enjoy the face-to-face meetings since the customer is my primary knowledge base about applications, problems, solutions, and – most of the time – compromises when it comes to applying a connector into a system. As most of you know, connector selection is a world of compromises when it comes to electrical and data rate related performances, ambient conditions, environmental requirements and finally application issues like pick & place, pin-in-paste, or other questions of how to bring the connector into the equipment. 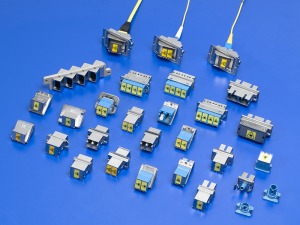 The above sounds like it may refer to copper connectors, but the same is true for fiber optic connectors. Molex is leading the way with fiber optic connectors, adapters, and our FlexPlane™ Optical Circuitry technology makes us the first choice to call, especially in a world where data rates are getting so high that copper transmission over printed circuit boards is questionable. Many customers are now looking for on-board fiber transceivers and want to do the wiring between the boards via fiber. Molex also does have silicon photonics technology in house and further develops this technology from existing plug in modules for QSFP, SFP, and even CXP cages onto the board. 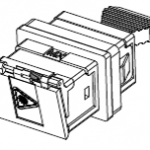 So, for a customer who decides to go fiber, we can offer everything: The on-board-module, the fiber shuffle on the board, the I/O adapters, and even optical subassemblies when it comes to matrixes with a few hundred to be shuffled. Whether this is done with multimode (MM) fibers or with singlemode (SM) fibers depends on speed and reach caused by the dispersion of fiber transmission in MM or SM fibers. This comment makes sense, as the new dust cap looks like a cost reduction. However, don’t close the subject without asking the customer! Because of practical reasons we have taken the following supply chain decision: The front panels are made at a subcontractor. Our own production line prefers, that the received frontpanels already contain the pre-mounted MTP adaptors. This significantly reduces the average human operation time (per board) in our clean rooms. So the MTP adaptors will be shipped to the subcontractor, where they will screw these onto the frontpanels. The dustcaps are required for the frontpanel delivery. The original dustcaps can’t be put to the MTP adaptor, because the frontpanel’s side is too close. So, we will proceed to tool the new internal dust cap which allows the customer to mount the adapters into the panels at their subcontractor without opening the dust cap. The dust cap keeps dust away until the final assembly of these front panels take place in the clean room. Lesson learned! It is important to think about the final application of our products and it is even more important to listen to the voice of the customer.